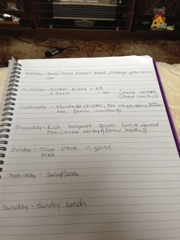 Slimming World Diary: Meal Plan for the Week .. So, normal Sunday protocol today. I had a scrummy Sunday lunch of chicken, veg, small Yorkshire pudding and gravy. I've done well with my snacking today, I chose grapes instead of anything fattening. I unfortunately couldn't get any exercise in today so I'll have to push myself tomorrow at swimming. There is something I have tried different today and that is a meal plan, I have set out meals for the week and worked out the syns for each meal.